This objective is concerned with continuing to build the local, regional and national reputation of the Cathedral Quarter as a place for the evening and night-time economy, retail, leisure, culture and professional services. Below are just a sample of some of the projects and activities undertaken by Cathedral Quarter BID as part of this objective. The Cathedral Quarter BID continually work to raise the profile of the Cathedral Quarter locally, regionally and nationally. The BID runs an annual marketing and advertising campaign using various mediums to target different demographics and to promote the different business sector strengths in the area. The BID also issues press releases on a regular basis generating significant advertising coverage in the media. The new Cathedral Quarter loyalty card scheme launched in 2018 improves the service and benefits to people visiting businesses on a regular basis, including employees of Cathedral Quarter businesses. Loyalty schemes can increase frequency of visits, attract new shoppers and clients and increase basket spend. Click here for more information. 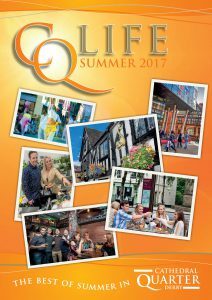 The Cathedral Quarter BID produces three CQ Life Magazines each year providing businesses with additional advertising opportunities. CQ Summer & Winter Life magazines provide opportunities for the retail, evening economy, culture and leisure sectors whilst CQ Business Life is dedicated solely to professional services. To see the latest issues of the magazines please click here. The Cathedral Quarter BID produces 30,000 copies of the Cathedral Quarter Mini Guide, available to visitors through Art Boxes across the County, Derby Sales & Information Centre, Cathedral Quarter businesses and locations throughout the city. The Mini Guide provides a useful introduction to the area providing the visitor with an overview of the area, its history and its businesses as well as a large map of the area. Click here to view. The BID has a prominent presence on Twitter, Facebook, Instagram, Linked In and You Tube and uses these to promote the Cathedral Quarter and inform businesses and members of the public about BID events and activities. The BID also runs social media campaigns throughout the year, promoting the Cathedral Quarter to visitors and maximising exposure for businesses. 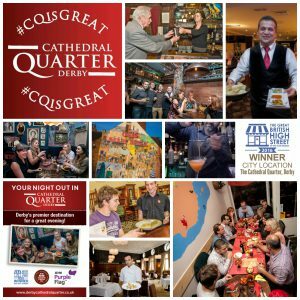 All businesses are encouraged to use the Cathedral Quarter tags when making their own social media posts; in this way we can share posts where appropriate and increase the viewing audience. The Cathedral Quarter BID like to keep you informed about the projects and initiatives you have identified as priorities for the area. 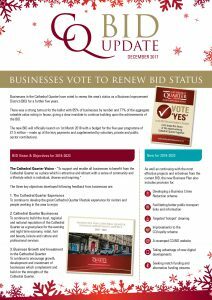 To do this the BID creates two newsletters a year, sends out an Annual Review with levy bills, produces ebulletins on a weekly basis, holds a monthly Business & Retail in the City meeting and hosts events and seminars.